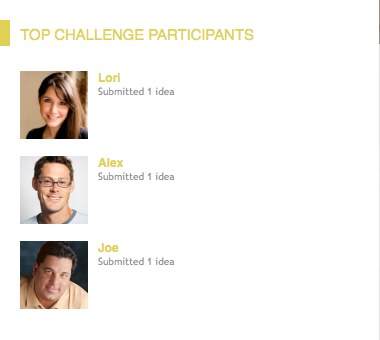 The Top Challenge Participants widget shows a list of the users with the most Challenge ideas. The purpose is to stimulate members to submit ideas in The Challenge Module. In the list, you see an overview of users in order of the amount of challenge ideas submitted, with a picture, username, and number of ideas. Search for the Top Challenge Participants widget and select Edit at the Options drop-down.